With the holidays coming up, I think it’s important to go over what I like to call the basics of putting together a cheese plate. I must say that this is the easiest way to put out “appetizers” and it always goes over well with your guests. I don’t think there is any reason to do much more than this when hosting a party. Although I must say that I always make Ina Garten’s sausage stuffed mushrooms as well because they are simply out of this world. Choose a sharp cheese like an aged cheddar, aged gouda or parmesan. Choose a good blue cheese such as stilton, moody blue (Smoked Blue Cheese), or gorgonzola. Choose a delicious, tangy chèvre, goat gouda, drunken goat, or manchego. This is a great option to have in case there are any children at the party. I often go with a port wine cheddar cheese spread. If the store is open, I will go for our own hand-mixed champagne cheddar. Choose some type of brie-like cheese such as Fromage D’Affinois, Delice de Bourgogne, St. Andre, or St. Angel. You can also top them with fig jam or have a side of chutney as an option. The possibilities are endless. Choose prosciutto, chorizo, salami, or sopressata. Go wild and choose a couple! Choose from olives, cornichons, gherkins, roasted red peppers, or marinated artichokes. Choose any type of cracker that you prefer or a freshly baked bread. Of course, I like to use French bread from the bakery. I also prefer to use pita chips, flatbreads, and nut and fruit crackers such as the Almondina brand. An arrangement of these will make for a successful cocktail hour. Everyone will be pleased to meet your cheese tray at your next holiday party. 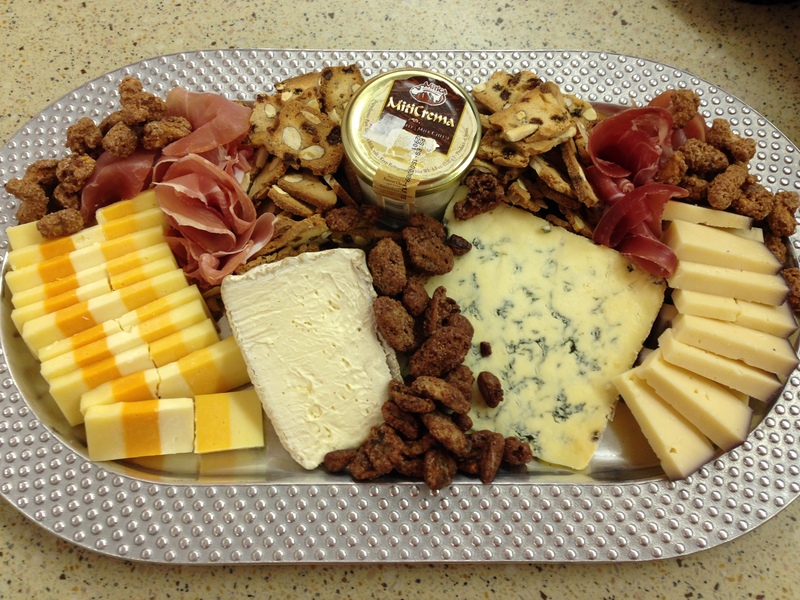 This is a cheese platter that I put together for a customer at the bakery. 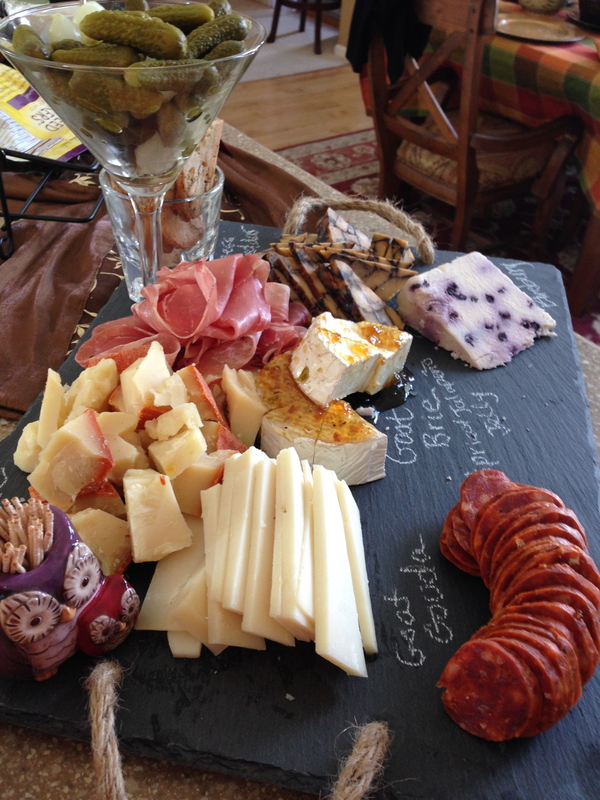 Their guests were happy with the choices I made…Five Counties, Delice de Bourgogne, Stilton, Miticrema, and Bellavitano. 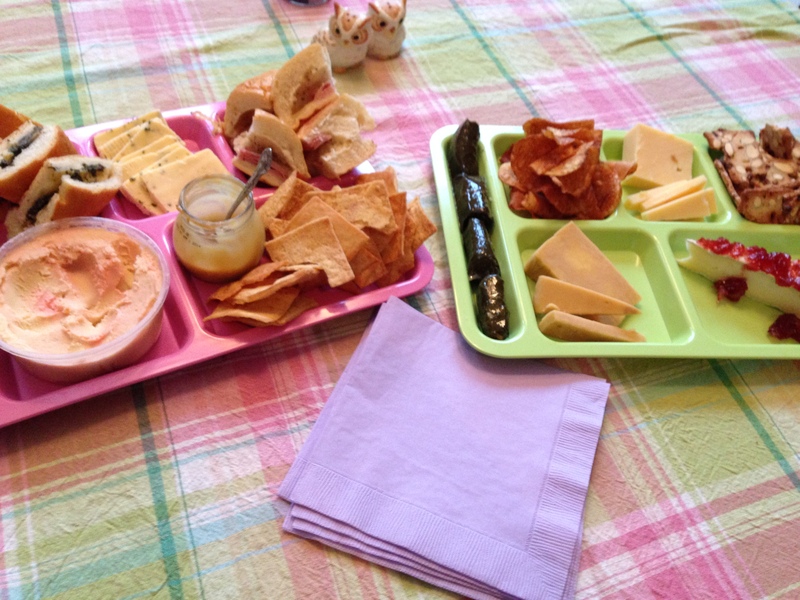 This is a cheese platter I put together for a friend and I for a fun summer picnic on my back deck. It was all we needed for dinner. Everything you see here can be found at my bakery. That’s an advantage of owning your own store! This graphite serving board allows you to write the name of the cheese onto the platter using a piece of soapstone. My friend Kelly got this for me for my 30th birthday and I love it!